Best wishes for Easter, Passover, egg hunting or however you choose to observe this holiday. 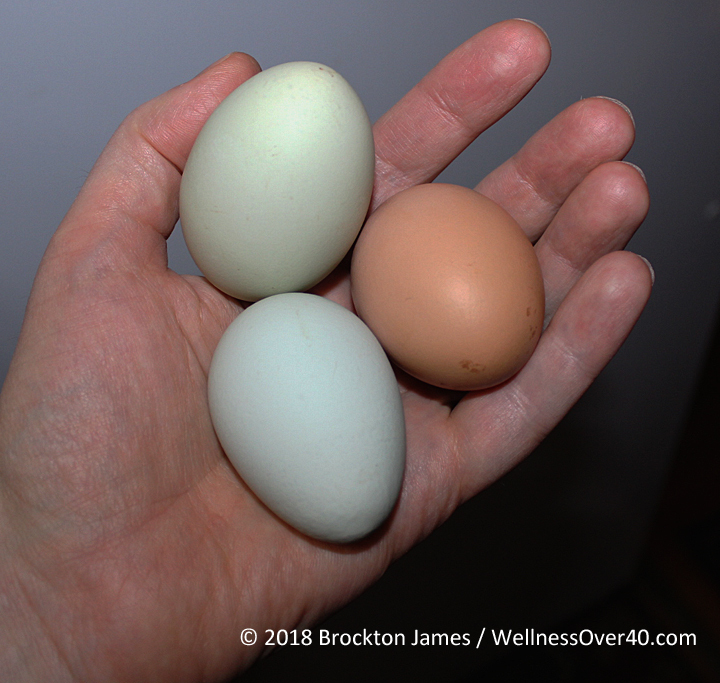 Pictured below, are farm-fresh eggs (from a neighbor), colored by nature (brown, light blue and light green), and laid by hens that get to roam around, scratch the ground and eat bugs like they’re supposed to! Eggs like these are not only delicious, but are extremely good for you, with a high nutrient density, and high-quality protein (6g with all 9 essential amino acids). Eggs also contain vitamins such as A, B6, B12, and D, as well as iron, phosphorous and selenium. The yolk also contains a compound called choline (about 115mg), which is excellent for your brain health. Even though the nutrients are the same regardless of the source, I strongly urge you to only purchase eggs that are free-range, hormone free certified organic and certified by the Humane Society. Or even better: directly from a trusted farm or even your own chickens if you live in a properly zoned area and are able to have and care for chickens! Additional Information: Eggs of course, were given a bad “rap” by the US Department of Agriculture in recent decades (beginning in the 1970s) due to the cholesterol level in the yolks. In recent years, they have changed their stance, as we now know that science has proven that dietary cholesterol intake barely affects blood cholesterol levels in most people. Without going into long explanations here, I am providing the following link with will expand on, and explain everything you could possibly want to know about one of nature’s perfect foods!